I have your next seventh-inning stretch singer here. All he requires for his appearance is three tickets to Chicago from California, a sippy cup of milk, and a hot dog (perhaps an adult soda for his handler). He might not start out perfectly, but hey, it’s not like Ozzy Osbourne knew any the lyrics to Take Me Out. And anyway, it’s all about the finish. This candidate finishes with gusto. If you’d like to book this act, please contact our agent, Banknotes Harper, at the cc’ed address. Where should I put this booger I have picked. Shall I put it on my shirt? Shall I put it on the seat in front of me? Shall I contemplate it for a while? Shall I let it drop? I have no witty words, other than perhaps a mention that mispronunciation must run in the family. Otherwise, I have only blatant use of my son for all the page hits. Yes, you got it right son. So right. Excellent Reporter C. Trent Rosecrans was doing his best reportage when it came to the gathering hordes for Scott Boras’ annual Winter Meetings Address. Maybe you have to look a little closer to see how serious this author was being. First came the vote for the American League Rookie of the year. Fine. Maybe they just didn’t feel comfortable voting on a guy they didn’t see before voting. It’s pretty hard to call up a stat sheet, maybe call a friend covering the Rays, and hey Cody Allen did have a great season. Position players are over-rated. Then came the vote for American League Manager of the year. Well, now that’s a little peculiar. Could it be? I can be small. Happy that John Farrell didn't win manager of the year. Still think he pulled a fast one on some really great people. Reminds me of the time I offered to get the table beers while losing at poker. Winner got my twenty bucks and a warm skunked Heineken I found downstairs. Or the time I convinced the scorer — she liked me — to change Carson Cistulli’s hit to an error because Cistulli played more often than I did on our JV squad. Or the time I bid all of my free agent budget on Travis d’Arnaud just because I knew Mike Podhorzer needed a catcher in our TOUT league. (He won anyway.) Or the time I traded Adam Wainwright because he struck out Carlos Beltran like that. Or the time I kicked my nineteen-month old son’s ball over the fence because he scored a goal on me. It all started so innocently. Game one of the ALDS, too, so there was still plenty of baseball to play. The pitcher wasn’t paying attention, the runner at first thought nobody was looking, and so he took off for second base. Bartolo Colon arose from his slumber and tossed the ball to Jed Lowrie for the out, and the world wondered for a brief second why Torii Hunter would do such a thing. So in the bottom ninth of that same first game of the ALDS, maybe we were a little more primed for weird. Brandon Moss swings and misses badly at a Joaquin Benoit curve in the dirt, sure, and then the ball hits umpire Mark Wegner’s shin guard, yeah, and wait that’s the ball in play and yeah okay, now that we’re talking strange, it makes sense: Benoit gets the assist. And very few people in the world noticed that two things had just happened that had probably never happened before in the same game, let alone in same season. This might have shown up in an error book before. You might read it as “double play ball fielded by the second baseman, and the third baseman muffed the throw from catcher.” You could read it that way. Which seems to be a failure for scorekeeping. This should read something like “F-C 4-2, OBSTRWTF, RS OMG.” Maybe. In any case, it doesn’t quite capture the weirdness that was watching Will Middlebrooks doing The Worm in slow motion as we all watched and tried to decide if he meant to take Allen Craig down, or if it was just Allen Craig showing off his wheels, all set against the despair in Dustin Pedroia’s face. Well now there we have a downright normal scorecard offering. It’s all context here. Making the third out with the go-ahead run at the plate is a no-no, written or not. And without knowing that it was rookie Kolten Wong at first, and “can we get him a world series win” Carlos Beltran at the plate, you might not get how bizarre this was. And then you add in how the game ended the night before, and really these four characters don’t do it any justice. So what will happen tonight? Maybe we could get another phantom grand slam? Or how about a steals-second-no-steals-first moment? A walk-off balk where the pitcher lets the ball drop on the mound? We can only keep our pencils sharp and our minds open. These numbers appear on our website in different places, and the equation makes sense, if not math sense. Do you know what this means? Does calling someone classless imply that you are of a higher class then them? Or just that you understand class better? Aren’t both of these things born of aristocratic sensibilities? Even considering class, is getting mad at someone for partying in your above-ground pool a little like getting mad at someone for drinking all your wine coolers and passing out in your inflatable couch? Was it disrespectful? 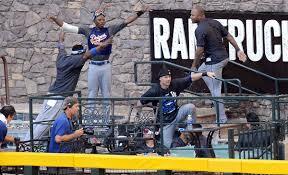 Did the celebrating players consider the feelings of the D-backs or where they being spontaneous? Did they cause more work for the stadium crew when compared to other road celebrations? How about compared to a home celebration? Do the workers get overtime? Was it disrespectful of the D-backs’ request to not party on the field? Was that request par for the course or out of the norm? Was that request even passed on to the players? How much is on the Dodgers’ administration more than the players? Some say the pool itself doesn’t matter, but is that true? Would players celebrate in other features, like the big glove in San Francisco? And if that sounds stupid, what about the slide in Milwaukee? Would we really get mad at seeing a bunch of jubilant players sliding down a slide? Is there a section of the unwritten rules pertaining to clinching celebrations? We know there is a section for home run celebrations, but did the ghost-writers of the invisible constitution consider end-of-season celebrations? And what does that section allow and not allow? What if the Dodgers were celebrating in Anaheim and had a lot of fans at the field? Still a no-no to come back out on the field? The fake rocks? Is the no-no the use of a stadium prop or facilities?